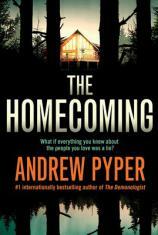 Andrew Pyper has had a great career and seems to get better with each novel. His prior books have jumped between horror, sci-fi and psychological terror, and a Best Novel award from the International Thriller Writers was given to his supernatural tale, THE DEMONOLOGIST. He's been called Canada's answer to Stephen King, and that may not be too far from the truth. However, nothing I have read from Pyper prepared me for THE HOMECOMING. It starts like a standard thriller involving a family and their hidden secrets, but then abruptly changes to a dystopian work with a nice amount of horror thrown in. Things open up with the Quinlan family gathering at a mountain lodge in the Pacific Northwest on a piece of seemingly endless property filled with forests and other surprises. The subject of the meeting is to hear their late father's will being read. Raymond, a very wealthy man, died suddenly, and his mostly estranged family is puzzled as to the location where they must meet to hear how much money he left each of them. Present along with the lawyer who will be reading the will are Aaron, Franny, Bridge and their mother. They learn that the lodge was called Belfountain, and 14-year-old Bridge is the only one of the group who has a strange sensation that she has been in this place before. Belfountain amasses 600 acres of pristine rain forest and probably will be part of the holdings that will be willed to the family. The lawyer, Fogarty, reads the straightforward will; all of their father's property and money were left for his wife and family. However, there is one very big catch. The family will not be given anything until they have spent one month at Belfountain. They will not be allowed cell phones or any TV or radio. If any of them defy this request, or attempt to leave the property at any time, they would forfeit their portion of the will. This extremely odd request is that much more uncomfortable as the family has not been very close. In fact, the siblings don't have much of a memory at all of their wealthy father who was mostly an absentee parent as they were growing up. Aaron, the oldest sibling, practically had to take on the role of father for his younger sister, Bridge. The most uncomfortable of all is Franny, who claims to be a recovered drug addict and had long been out of touch with the rest of her family. "Be prepared for a wild ending that will make you question how well you really know those who are close to you --- and also give you some great material for more than a few nightmares!" Still, they decide to give it a go and begin exploring the strange Belfountain main lodge. All the while, each of the Quinlans is dealing with strange memories and feelings close to déjà vu as they interact with each other or attempt to dig up any shared memories of time with their father. When they decide to explore the woods and various trails that lead away from the lodge, they all have the sensation that someone is watching them. It is at this point, when the reader is settling into what will happen next to the family, that Pyper throws a major curveball. The Quinlans receive some very unexpected guests at Belfountain: a party of four claiming to be Raymond's children --- Jerry, twin brothers Elias and Ezra, and an African-American adopted sister, Lauren. This explains a lot about the absentee father feelings our original Quinlan family felt as it is now evident that he had a second wife and family who were completely unknown to any of them. The situation calls to mind the classic horror film The Stepfather, which dealt with a homicidal man who kept multiple families going at the same time. All eight Quinlans are now in the Belfountain lodge, each held to the same boundaries spelled out in the will, as the same will was left for both of Raymond's families. Pyper makes a very prophetic statement when he pens the line “families teach us who we are.” Readers need to keep that in mind as they pore over the rest of this tricky novel. Things start to get really weird when the group comes across other people on the property. They give the monikers “The Tall Man” and “The Witch” to the two strange and potentially dangerous individuals. The Quinlans have no idea if they are part of their test or something far worse. Things suddenly escalate when a few of them come across what looks like a Christian summer camp that has pentagrams sprayed on the walls, along with weird, somewhat satanic, phrases. Soon after, Elias is attacked by an unknown person while out in the woods and is bleeding to death from the hatchet stuck in his abdomen. He is brought back to the lodge, and Aaron is called on to save him as he is a surgeon. But Aaron freezes up and only makes matters worse by pushing on Elias and causing him to bleed out quicker. Even though there was probably no hope for Elias, it is odd that a doctor did not know what to do to try and save him. Now, with one member of their party murdered, it seems like the stakes are extremely high for the survivors. Some of them have no desire to stay and realize that no amount of money is worth their lives. They put their heads together to try and come up with a game plan, while suddenly the mother of the first Quinlan family leaves them without a trace. Could she be in on this deadly game that is being played? Is Raymond still alive and merely toying with them? Are the strangers in the woods homicidal maniacs seeking to pick them off one by one? All of these questions will be answered, but not before the biggest plot twist of them all. It's impossible to describe the narrative further without giving away more of Pyper's clever secrets. THE HOMECOMING is an interesting novel that proves to be the most intricately plotted work he has written to date. Be prepared for a wild ending that will make you question how well you really know those who are close to you --- and also give you some great material for more than a few nightmares!